Hackers probably got into a Wenzhou, Zhejiang school’s text-sending platform and fired off a very inappropriate message to 600 parents yesterday. Then again, the message probably contained only the hard truth. I mean, have you seen children? 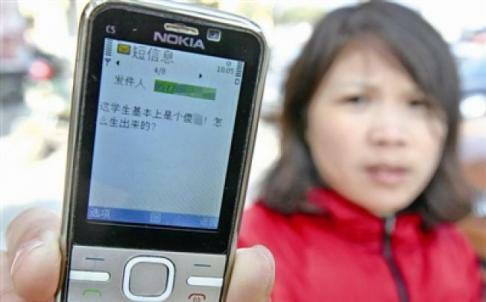 More than 600 parents in China’s eastern Zhejiang province were shocked and furious after receiving a text message from their children’s school calling pupils “a piece of s**t,” reported China’s Wenzhou Metropolis Daily on Thursday. …A school spokesperson said the message was the result of a software malfunction. Exactly! The message was only supposed to be sent to parents who failed to deliver a sufficiently stuff HongBao last year!